Risks undermining the role of the U.S. as a champion and supporter of democracy on the world stage. Most dangerous country in the world. Illegal Wars. The U.S. war on Iraq in 2003 was called an “illegal war” by United Nations’ Secretary General Kofi Annan, a close U.S. ally, the following year. Coup d’États. It is not as if the U.S. government’s history of engineering coups is in the past—let us say, the coups against the democratically elected governments in Iran (1953) or Guatemala (1954). The U.S.-driven coup against the democratically elected government of Honduras—a coup condemned by the United Nations General Assembly—took place in 2009. The U.S. has openly called for a coup against the government in Venezuela. The current language is to speak of “regime change” and not a “coup” directly, but this is merely a change of expression rather than of substance. Torture. The United Nations High Commissioner for Human Rights has—since 2001—condemned the use of torture by the United States in its self-styled ‘War on Terror.’ Torture is against every value of the United Nations. Arms Sales. The United States is by far the largest merchant of weapons, selling to 98 countries. A full third of the world’s arms sales are made by the United States, according to the Stockholm International Peace Research Institute’s 2018 report. This percentage is only increasing. It is hard to square such enormous arms sales with any consideration for human rights and peace. Trade Policies That Produce Hunger. The United States and its allies have driven a set of trade policies (liberalization) that have adversely affected the majority of the world’s population. Hunger and ill-health have resulted from these policies. Human rights advocates rarely look at hunger as a metric of the human condition. UN Migration and Refugee Compact. UN Education, Scientific and Cultural Organization (UNESCO). UN Framework Convention on Climate Change—Paris Agreement. UN Convention on the Laws of the Sea. UN Convention on Cluster Munitions. UN Optional Protocol to the Convention Against Torture. The withdrawal from the UN Human Rights Council must be seen in this context. If Washington does not get its way, it either tries to undermine the UN body or it leaves. In the 1970s, the Nixon administration sent Daniel Patrick Moynihan to the UN as the U.S. ambassador with the express purpose of undermining the General Assembly and moving its powers to the UN Security Council (I document this in Poorer Nations). Since the U.S. had a veto in the Security Council, it could properly try and control the verdict of the UN. That was the goal. Indeed, Moynihan succeeded in setting aside the General Assembly. Its resolutions are now not treated as serious. Attention is focused on the Security Council. Trump’s ambassador—Nikki Haley—was sent to the UN with instructions to undermine the UN Human Rights Council, set up in 2006. The United States was unhappy with the Human Rights Council’s approach toward U.S. militarism and toward Israel. Haley pretended that the issue was democracy within the Council. She tried to create a coalition to call for a different kind of voting mechanism to get on the Council, including a litmus test of which countries would be considered too brutal to be allowed a seat in the chamber. The U.S. could not drum up enough support. 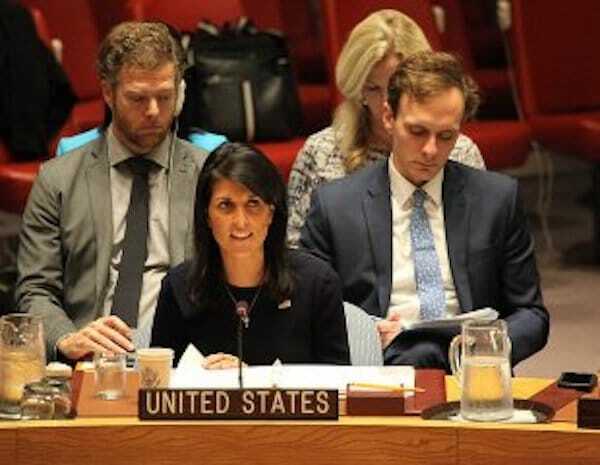 In Geneva, Haley said that if the Council did not “reform” (namely conform to U.S. wishes), the United States would “go elsewhere” for its human rights agenda. Haley tried to get the Security Council to take up the work of the Human Rights Council, but she failed. These failures to dominate the Human Rights Council resulted in the withdrawal of the United States. What Bothered the United States? The United States is happy to criticize countries around the world that are not its allies, but it will not tolerate any criticism of itself. Last year, the Human Rights Council’s special rapporteur on extreme poverty and human rights reported that the tax policies of the United States made the U.S. one of the “most unequal societies in the world.” This rankled the Trump administration. But the real burr under Trump’s saddle has been the Human Rights Council’s criticism of Israel. The Council, following several UN resolutions, has been obliged to study the Israeli occupation of Palestine and the various violations of UN resolutions by Israel. In recent years, the Human Rights Council has been more aggressive in this agenda. In January, the Human Rights Council delivered a preliminary report about its database of companies that have violated UN Security Council Resolution no. 2334 on doing business with Israeli settlement firms. The United States—on behalf of its own companies and of Israel—has sought to block this report. It has not been able to do so. If the work on this report goes forward, it would be a boost to the Boycott-Divest-Sanctions (BDS) movement. This is because the report would give UN sanction not only to boycott these firms, but it would place these firms in a pariah-like situation. For the United States, it is acceptable to run sanctions policies against its adversaries—Iran, North Korea, Russia, Venezuela—but it is unacceptable to allow these to impact its friends. This is not a matter of principle regarding human rights, but of politics. The United States, which has a history of promoting human rights violations, has now left the UN Human Rights Council. So be it. Here is one more illustration of the decline of U.S. influence on the world stage. This article was produced by Globetrotter, a project of the Independent Media Institute. The big story is in other commercial services, which include the range of services in which U.S. companies are globally competitive: construction; insurance and pension services; charges for the use of intellectual property; telecommunications, computer and information services; other business services; and personal, cultural and recreational services . The trade balance in this category increased significantly from $164 billion in the last year of the Obama administration, to $175 billion in the first year of President Trump. For whatever reason, the rents of U.S. MNCs from various kinds of intellectual property and market dominance in media and entertainment industries, as well as the sector so beloved of the U.S. President, construction, have already shown even greater increases during his tenure so far. What are the implications of all this for the US’s trading partners? The obvious lessons are already well known: do not expect any concessions from the U.S. on any front and watch your own back. But there are other less obvious lessons. Pious neo-liberal multilateralism, as expressed in the rules and operations of the WTO, created a system of monstrous but legally entrenched inequalities. The implosion of that system lays bare some of its hypocrisy. Perhaps smashing the myth of benign intent will allow all countries to demand policy space to address the real concerns of their own citizens.